Since its invention in 1902 by Deutsche Waffen und Munitionsfabriken, the 9mm cartridge has become the most widely used military handgun cartridge in the world. 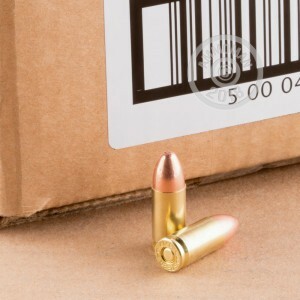 In order to stay at the top of our game, we here at AmmoMan.com offer a variety of quality 9mm shooting solutions, including this bulk pack of 1,000 loose rounds by Blazer Brass. 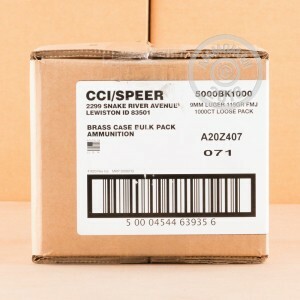 Unlike Blazer’s better known line of aluminum cased ammunition, these rounds sport factory fresh brass casings, making them ideal for handloading enthusiasts as well as those who patronize ranges that get bent out of shape whenever they see aluminum come through their doors. (It’s a big fly in their ointment if they like to sell the mountain of brass scattered around their floor at the end of every day.) With its 1,125 fps muzzle velocity and 115 grain projectile this is a very average performing round, and thus an appropriate one for familiarizing yourself with your handgun’s performance while training, and its bullet’s full metal jacket will preserve your accuracy during high volume shooting sessions. Even by itself, this approximately 27 pound box qualifies for our free shipping offer, so be sure to stock up so long as the postage and handling is on our dime!